The Claiborne Pell Bridge, commonly known as the Newport Bridge, is a suspension bridge operated by the Rhode Island Turnpike and Bridge Authority that spans the East Passage of the Narragansett Bay in Rhode Island (northeastern United States). 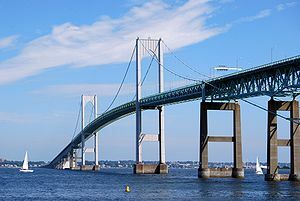 The bridge, part of RI 138, connects the City of Newport on Aquidneck Island and the Town of Jamestown on Conanicut Island, and is named for longtime Rhode Island U.S. senator Claiborne Pell who lived in Newport. The Pell Bridge is in turn connected to the mainland by the Jamestown Verrazzano Bridge. 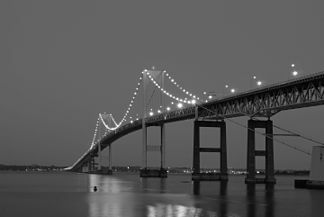 The Claiborne Pell Newport Bridge is a toll bridge, and the cash toll is US$4.00 for cars (as of 2015). From its opening in 1969 until 2009, the toll could be paid by cash or with tokens, which were purchased at the RIBTA office in Jamestown. E-ZPass was introduced as a toll payment in 2008. Shortly thereafter, the tokens were phased out as a form of toll payment. The final day that tokens were accepted on the bridge was December 31, 2009. Following that date, the only accepted forms of payment were cash or E-ZPass. Rhode Island residents with a Rhode Island E-ZPass pay a discounted toll of only 83 cents once they sign up for the RIR-RI Resident Discount Plan. Early in 2012, the Authority had voted to raise tolls for passenger vehicles to $5. However, on June 15, 2012 this plan was abolished as Rhode Island lawmakers approved tolls to be added to the newly built Sakonnet River Bridge in the future. The bridge also charges a fee equal to the toll for improperly mounted E-ZPass transponders that require a toll-booth operator to manually raise the gate. Out-of-state residents pay full price, even with a Rhode Island E-ZPass, making this bridge the only toll facility in the U.S. to give a residence discount that isn't limited to the adjacent neighborhoods. The bridge was the only toll road in Rhode Island until August 19, 2013, when the Authority began collecting tolls on the new Sakonnet River Bridge. However, toll collection on that bridge ended on June 20, 2014. In the spring of 2012, the Bridge Authority brought Open Road Tolling to the Pell bridge, allowing drivers with E-ZPass to pass through a special E-ZPass only toll lane at 40 mph. Violators are subject to a $10 fine, on top of the unpaid toll. The new lanes opened to traffic on June 22, in time for the America's Cup sailing race being held in Newport. Prior to the establishment of the E-ZPass system of toll collection, toll discounts were available to the general population through the use of tokens. A roll of 9 bridge crossing tokens could be purchased for $10 (plus one free crossing) bringing the effective price per crossing $1, available to anyone. Establishment of the E-ZPass system and elimination of tokens also eliminated discounts for non-residents. The bridge was constructed from 1966 to 1969 at a cost of U.S.$54,742,000 by the Parsons, Brinckerhoff, Quade & Douglas company. The bridge was renamed for U.S. Senator Claiborne Pell in 1992, but is still commonly referred to as the Newport Bridge by residents of nearby towns. The bridge is featured on the Rhode Island state quarter. The first time that runners were allowed over the bridge was when a group of 300 runners ran over in the early 1980s in a half-marathon for Save The Bay. In the fall of 2011, the inaugural Citizens Bank Newport Pell Bridge Run was held which marked the first time in recent history that runners were allowed to cross the bridge (which was closed to traffic). Bicycles are not permitted on this bridge, but Rhode Island Public Transit Authority bus #64 has bike racks for weekday and Saturday travel. ^ "Claiborne Pell (Newport) Bridge (RI 138)". Retrieved 2008-04-28. ^ Naylor, Donita. "Newport Pell Bridge will close 'high-speed' toll lanes for 17 days to install upgrades". providencejournal.com. Retrieved 11 October 2016. ^ "Redeem bridge tokens before Dec. 31 | www.jamestownpress.com | Jamestown Press". Jamestown Press. Retrieved 11 October 2016. ^ "No increase for Pell Bridge tolls". Archived from the original on 2012-06-19. Retrieved 2012-06-19. ^ "Unmounted E-ZPass will cause extra fees". Archived from the original on 2012-11-07. Retrieved 2012-05-01. ^ "Rhode Island Turnpike and Bridge Authority Tolls". Retrieved 2013-11-11. ^ "Tolling on Sakonnet River Bridge Ends on Friday" (PDF). Rhode Island Turnpike and Bridge Authority. Retrieved 2014-06-20. ^ Shane, Ken. "Newport Bridge gets a facelift for first time in two decades | www.jamestownpress.com | Jamestown Press". The Jamestown Press. Retrieved 28 November 2016. ^ "Citizens Bank Bridge Run". Retrieved 2012-05-01. Wikimedia Commons has media related to Claiborne Pell Newport Bridge.